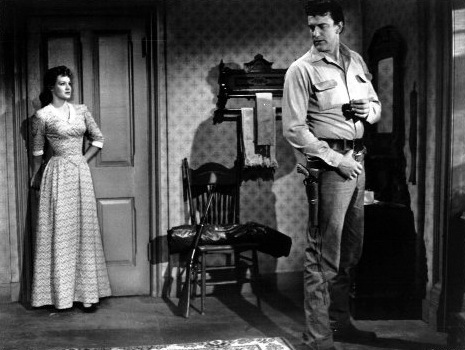 James Arness stars in GUN THE MAN DOWN (1956), a solid Western just released on DVD and Blu-ray by Olive Films. 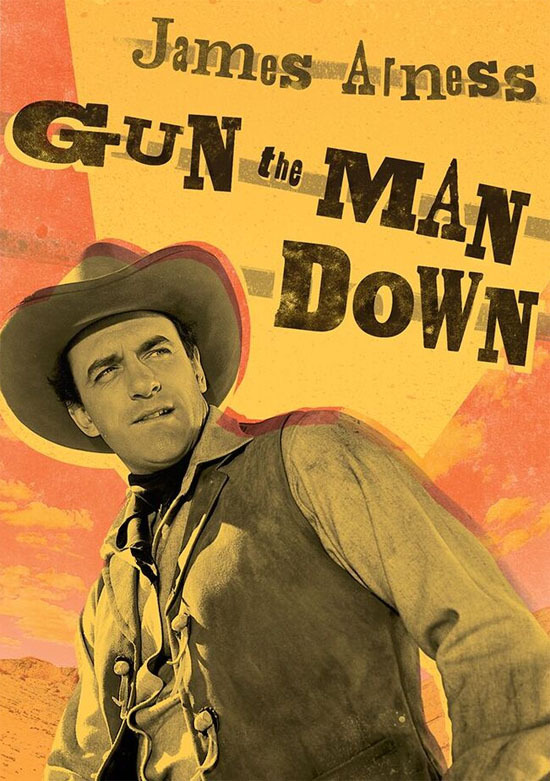 GUN THE MAN DOWN was made by John Wayne's Batjac Productions. It provided a starring role for Wayne's protege, James Arness, who had begun starring in the TV series GUNSMOKE the previous year; no one dreamed at that point the show would still be running two decades later! This was also one of the earliest scripts by Burt Kennedy, whose first film released was Batjac's SEVEN MEN FROM NOW (1956), starring Randolph Scott and directed by Budd Boetticher. Kennedy wrote all my favorite Scott-Boetticher films, including SEVEN MEN FROM NOW, and he directed my favorite James Garner movie, SUPPORT YOUR LOCAL SHERIFF! (1969). The same economical storytelling Kennedy used in SEVEN MEN FROM NOW is on display here, starting with the fast-paced introduction to the characters. 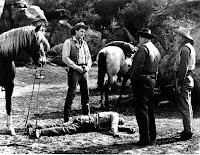 Rem Anderson (Arness) participates in a bank robbery with Rankin (Robert J. Wilke) and Farley (Don Megowan), but things go south and Rem is shot. Rankin and Farley take off with the stolen $40,000 and Rem's girl Janice (Angie Dickinson), leaving the wounded Rem behind to face the sheriff. After serving his time, Rem goes looking for Rankin and Farley, who now run a saloon. 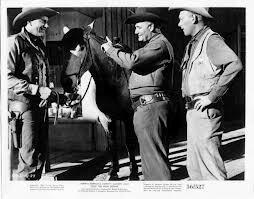 Rem reclaims his horse from Farley and later deals with a hired gun (Michael Emmet) brought to town by Rankin, all under the watchful eye of the sheriff (Emile Meyer) and his young deputy (Harry Carey Jr.). What will Rem do next? This was a fast-paced film, clocking in at 76 minutes, buoyed by a strong cast. In a sense it saves some time casting a familiar actor like Robert J. Wilke; a classic Western villain, the audience understands at first glance that he's probably not a good man. The chink in his armor is his weak spot for Janice, although it turns out in the end that, as suspected, he really only cares about himself. For me the relationship of Meyer and Carey was the high point of the movie; the protective, paternal Meyer likes to send Carey fishing with his little boy when things heat up, keeping him out of harm's way. At one point the sheriff tells the frustrated deputy that the town will be there for a long time, and the deputy can take care of it once the sheriff is gone. The sheriff also has a good relationship with Rem, regularly commenting he'd hate to have to hang him. At the end the sheriff is content to sit back with his deputy and let matters play out with Rem and Rankin, hoping Rem will choose to make the right decisions. The only drawback for me was the resolution of Janice's storyline, which cast a bit of a sad pall over the end of the movie. Dickinson had a good role as a woman who'd had a life of hard knocks but dreamed of being "respectable." I didn't care for the abrupt end to her story. 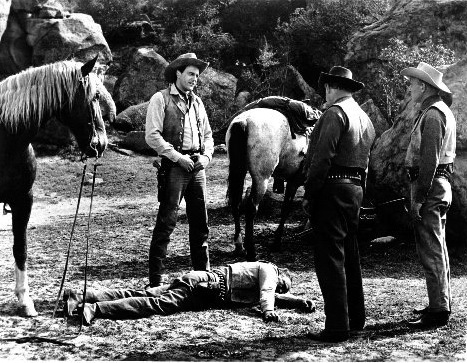 GUN THE MAN DOWN was directed by Andrew V. McLaglen and filmed by William H. Clothier, who both worked with John Wayne many times over the years. The Olive Films DVD is a nice widescreen black and white print. There are a few individual shots which look too grainy, but for the most part it's a nice crisp picture. Unlike most Olive Films DVDs, the disc includes the trailer, a welcome inclusion. A solid, taut little western. One of McLaglen's very best, helped enormously by Burt Kennedy's fine writing. Pity Arness did not make any more such features but I guess he just didn't have the time, not only starring in "GUNSMOKE" but also involved in production. But it was good to see him in such a contrasting role. Sounds like a good one! I also love Burt Kennedy's scripts. Jerry, thanks for sharing your thoughts on this. I agree, I would have liked to see Arness do more feature Westerns. It was interesting seeing him play a character who wasn't exactly the law and order type, given his most famous role. Deb, I think you might enjoy this, Kennedy has some good lines in the script and finds interesting ways to compress the storytelling. A postscript, suddenly realized today I'd listed Burt Kennedy as the screenwriter of SUPPORT YOUR LOCAL SHERIFF! when he was the director. (William Bowers wrote it.) I've updated the post! Again a very fair review. Considering those involved I was expecting more...good build up,flat ending. Nice to see Emile Meyer in a sympathetic role for a change. for me GUN THE MAN DOWN was an odd choice for the high-def treatment. Andre De Toth's THE INDIAN FIGHTER for example. other Western make such great use of Lone Pine. that I have ever seen of a CinemaScope Western. Forrest Tucker and William Elliott. Hollywood Scrapheap have proved good prints of these films DO exist. fare like HELL'S OUTPOST with Rod Cameron against a very bad John Russell. should have been a far bigger star. the more films I see them in. Thanks for the feedback, John! It's interesting that a number of Olive's recent and upcoming releases have already has DVD releases. I know Westerns fans like ourselves wish for those rare titles we've yet to see! Perhaps if the current releases are successful it will allow them to delve into more obscure titles in the future. We can hope! I'm also a fan of FORT DOBBS! That was an excellent film. "FORT DOBBS" is a big favourite at Jerry Towers!! I always liked Clint Walker in his Cheyenne Bodie TV role; considering he arrived in the role virtually from nowhere he had a commanding screen presence from the get-go. I also think this film contained one of Virginia Mayo's best-ever performances.